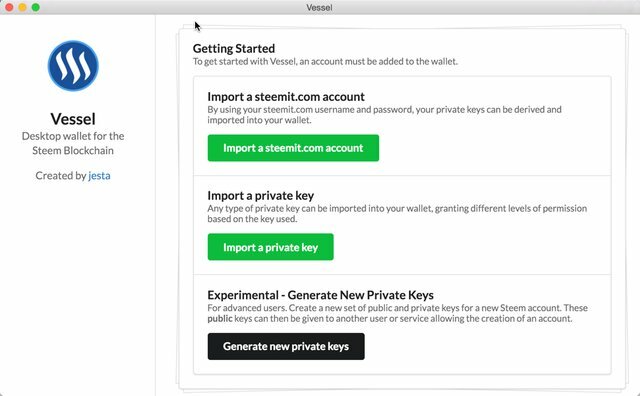 In Steem Secret #9, discover a desktop wallet for our Steem blockchain named Vessel created by witness @jesta which helps a lot with Steem Power delegation, storing private keys and making transactions all without the need to use steemit.com! 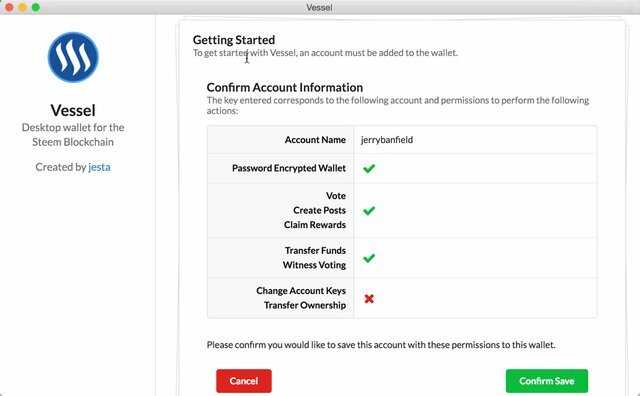 View the Vessel wallet at https://github.com/aaroncox/vessel and read this post to learn more! Easy Steem Power delegation removal which was the main purpose I downloaded it for after finding the wallet in a Google search for "remove Steem Power delegation." Using Vessel is the easiest way I know of to delete a Steem Power delegation or make a new one fast without having to use anything else. More posts about Steem Power delegation soon because now with this wallet we can see how to do it easily! Local encryption with a password combined with the ability to import the active key. 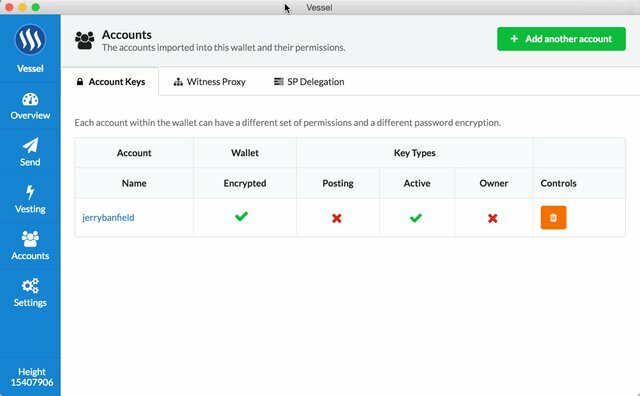 Now I have my wallet easily available without having to use steemit.com and it is encrypted for security on my computer. With active key access, I can do everything necessary in the wallet without fear of losing access to my account. Easy send to an exchange with stored memo keys. Bittrex uses the same memo every time which then eliminates the need to copy and paste it with this wallet when withdrawing Steem. Warning: if they change the memo without a double check prior to sending, this might cause a loss of the Steem or SBD sent. So far my transactions have all been on the same memo. 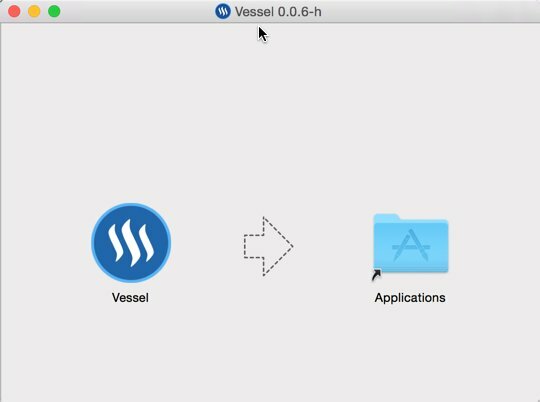 How to get started using the Vessel desktop wallet for the Steem blockchain today? Use a download link above and get the wallet installed on the computer. On mac, click past the warning for best results. Grab the private active and posting keys from https://steemit.com/@jerrybanfield/transfers by switching our your username for mine. Here are the screenshots for mac loading up the wallet! Picture one shows after opening the .dmg file to drag it into applications for easy access. Click past this warning on Mac. New wallet open screen. Click IMPORT PRIVATE KEY. Do not use the owner key which is the master password anywhere online for security! See the import key screen here to both enter the active key and encrypt the wallet with a password. After a successful import, this screen comes up! See account balances on the overview tab. Want to delegate Steem Power, remove a Steem Power delegation, or set a witness proxy? All of these options are under the accounts screen. 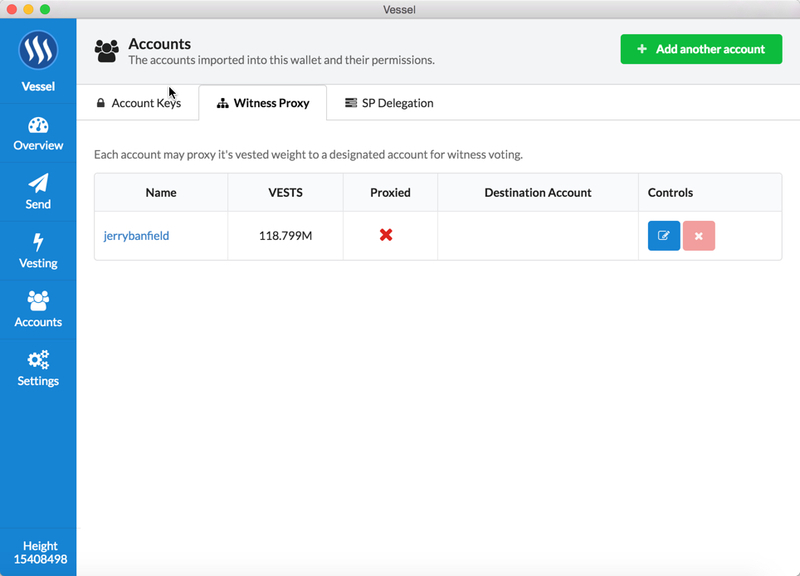 To set a witness proxy, use the witness proxy tab in the Vessel wallet or go to https://steemit.com/~witnesses. Witness votes are the most important votes we make on Steem because witness votes determine which users are paid as much as 250 Steem Power A DAY in rewards for maintaining the blockchain via Ubuntu Linux servers, witness updates, and community contributions. 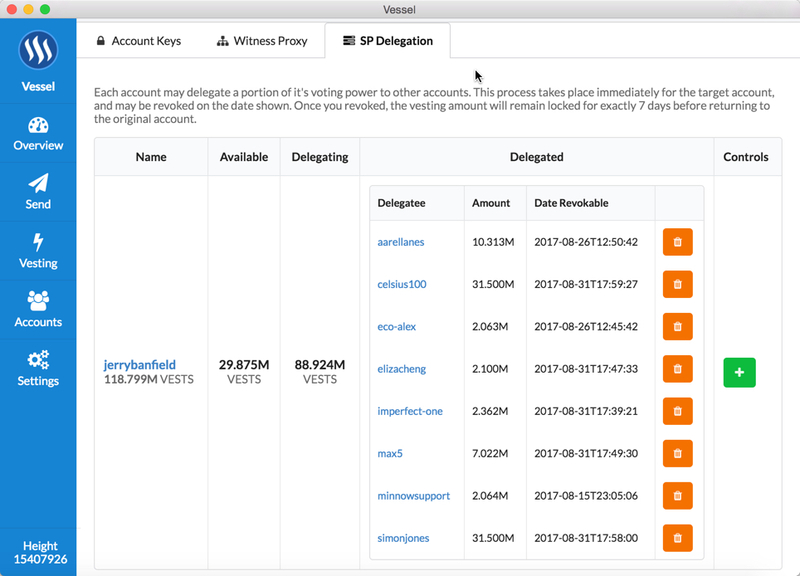 The easiest way to fully participate in witness voting is to set a proxy. A witness proxy allows another user to handle all witness voting and is the best way to make all witness votes with the least amount of effort. I am grateful today about 100 users trust me as a witness proxy on 199M VESTS of votes which is the equivalent of about 100,000 Steem Power because I put a lot of thought, research, and energy into each of my witness votes with generally checking them every day or at a minimum once a week. If you have not made any witness votes yet or are not interested in maintaining votes every week, would you please set jerrybanfield or another user you trust as a proxy to make all witness votes for you because these witness votes are the most important votes any of us make? 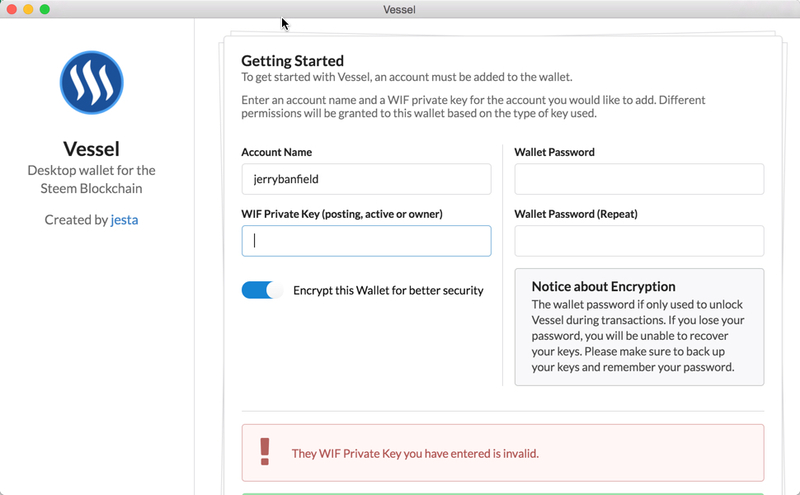 Here is how to use the Vessel wallet to set a proxy. First, click on the proxy tab. Finish the process by typing the exact name of the proxy in and hitting set proxy. The proxy can be removed or changed at any time. Delegating Steem Power allows us to give our voting power to another user which is ideal for lending voting power in exchange for a Steem payment as seen at https://www.minnowbooster.net/market or to just give a friend or trusted curator our Steem Power if we are not using it. 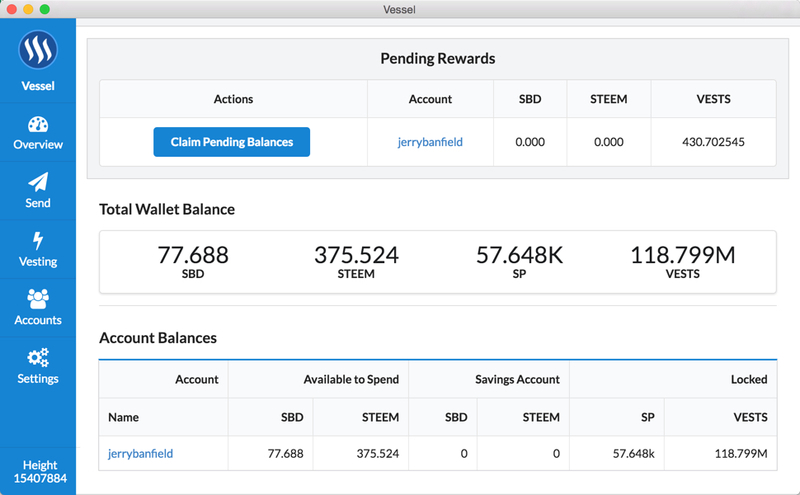 Without the Vessel wallet, managing Steem Power delegation is challenging especially when it comes to figuring out how to take the Steem Power we loaned out back. Vessel makes this really easy as seen below! To begin, click on the SP Delegation tab! Each Steem account we add here shows the total vesting balance along with the delegations made. Making a new delegation is as easy as clicking the plus side, entering the account we want to delegate to, and then clicking broadcast transaction! For example, if I wanted to delegate my wife @laurabanfield all my remaining voting power, I could do it like this. 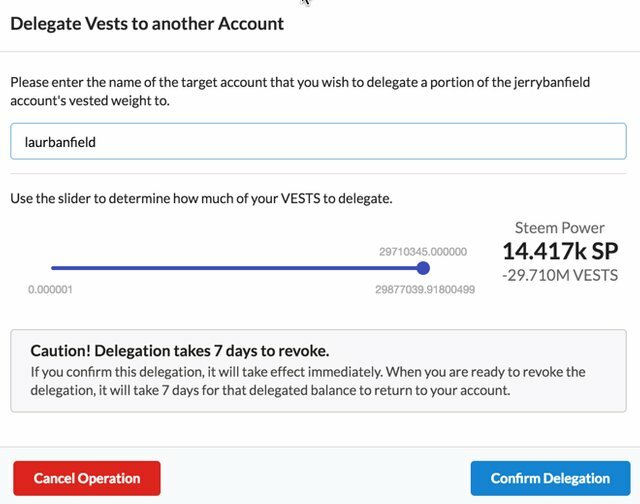 To remove Steem Power delegations, we go back to the SP Delegation menu and review the amount of vests we have delegated. We then click on the trash can symbol to remove the delegation. Once we have broadcast the transaction, then it takes 7 days for our Steem Power to come back to us! This is ideal for removing any delegations after the term has expired on https://www.minnowbooster.net/market which is part of the @minnowbooster project led by witness @reggaemuffin as a part of the @buildteam with witness and CEO @thecryptodrive. I appreciate you reading this post and hope you found it helpful! I am grateful @jesta created this wallet which has been fantastically helpful for me today in removing a Steem Power delegation along with creating https://steemdb.com/ which I use almost every day also! If you would like me to continue doing more posts like this, would you please upvote this post because the rewards empower me to do Steem full time here with you? Facebook page with 2,254,240 likes. PS: Witness votes are the most important votes we make on Steem because one vote for a witness lasts indefinitely! Would you please make a vote for jerrybanfield as a witness or set jerrybanfield as a proxy to handle all witness votes at https://steemit.com/~witnesses because when we make our votes, we feel in control of our future together? Thank you to the 798 accounts voting for me as a witness, the 198.4M VESTS assigned from users trusting me to make all witness votes by setting me as proxy, and @followbtcnews for making these .gif images! It is safe but eats your bandwidth if you used it more often. be aware that you open it just when you need it. But it is really useful. Thanks for this was thinking the same thing! Thanks dude for your services, appreciate that. I have been using vessel for 2 days now and it's really good. I'm a bit behind on updates for Vessel, but I do have an issue open to get this added. I'll see if I can squeeze it into the next release. I love your work.... ..
Can the delegated amount be used by either account during the seven day withdrawal period? anyone know? No there is a 7 day waiting period for both parties. I always learn something from your posts @jerrybanfield. I didn't know you could designate a proxy witness votes. I'm going to download this and set you as my proxy when I get the chance as I don't currently use all my witness votes. I have to do more research think steem is the first crypto currency with life implementation. we are already in the future! we can also power down from vessel or not? No, there are no fee's built into the wallet. It's completely free. I Really like the way you present yourself. After following your course i wrote a little post. Should be fun i you could spent some time of your reading the post. Jaxx is implementing steem right now. 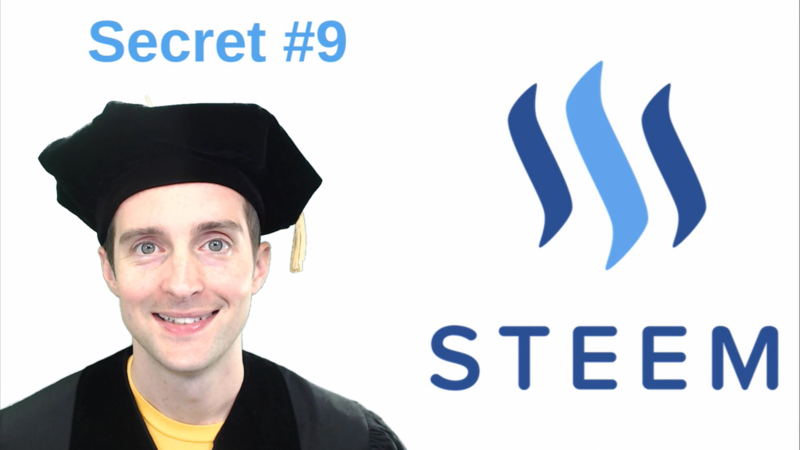 This is the reason why STEEM is the future. THANK YOU FOR THIS!! I have been looking!! Me too!! I need to learn more about post delegation!! @jerrybanfield JUST voted you as a WITNESS! :) Thanks for all your contributions to the community!! Everyone should go vote for @jerrybanfield if you haven't yet! Why not for a witness who gives back a share of his income? Like a witness pool? I am not really looking for @jerrybanfield's money or votes... the income he earns, is from the work he creates... why would I want to take that from him? I voted for him because he provides good information and he is dedicated to what he does.. I am not speaking about his steeming, but the witness income. You know you just setup a pc somewhere and it's on. I don't think that single witness owner has a future. For example @maryfavour referenced me a witness (witnessgigs) who use his witness reward to organize events. Steeming and running a witness isn't the same. I think it takes effort, time, money and knowledge to do these things, I'm willing to support and not expect someone to pay or reward me for it. I own a mining company... I process the blockchain for the coins we mine. Do I somehow owe the communities of the people I mine coins for some sort of reward because I am helping maintain their network? It's a DPOS like many others. Most other coins with DPOS have pools reward for votes, for example it's very common in LISK. I guess the technical level is way higher in LSK but don't worry it will come here the more steem is known. I have no problem with you keeping a fair share of your witness income. It's just that the situation isn't competitive enough to my taste, which reveals a lack of interest from the really knowledgeable users of blockchains. With a vote sharing model (which will arrive) the witness are pushed to operate their nodes in the most efficient way ever to be able to propose the greatest sharing possible. Running a witness is super easy, they are guides to follow with every single steps... you know it if you did. Is DPOS a scam? that's the real question... full PoS like PIVX or full PoW like BTC. This DPoS is quite scammy. It rings a bell, thank you. Lovely, I always thought we could need something like that soon! Nice post @Jerrybanfield ... upvoted and Resteemed it..
@jerrybanfield thanks for this good information. If I was sitting on a pile of Steem I too would see it as being the future. Btw steemians, if you know a witness "pool" it would be nice to share it. You know a witness who shares a part of his income with those voting for him. Cool! Thanks for sharing Jerry! It is an interesting program. I think about the STEEM accounts and keys so much different than I think about other crypto currencies. Thanks for the praise and the tutorial on getting started! Glad everyone's finding it to be useful. I've been working on a new build, and will hopefully have an update for Vessel soon (special thanks to @netuoso for the helping hand!). It's better to Wait to check the stability of this. Hello everyone reading this, our shares window for @teachersaroundme is open and it's been sold for $1 per share. You can purchase as many shares as you want for a higher return. TeachersAroundMe is an online digital ed-tech platform on a mission to restructure the education and skill acquisition sector in the world at large. You can be part of our revolution. Please check out our page to learn more. TeachersAroundMe - redefining lives positively. This post has been ranked within the top 10 most undervalued posts in the second half of Sep 12. We estimate that this post is undervalued by $62.68 as compared to a scenario in which every voter had an equal say. See the full rankings and details in The Daily Tribune: Sep 12 - Part II. You can also read about some of our methodology, data analysis and technical details in our initial post. Please i will like to ask how do i transfer my steem from bittrex to steemit. @jerrybanfield thanks for the write up i always learn from you. It would be great at that, previous transactions are saved and can be used again. Or something like an address book. That you don't have to type in the name of the account you're sending to. I have a list of bots I try to remember, but they are quite an amount now. Around 10 I have now. An actual address book to save the nicknames you want to send steem dollar. Would make life easier. It seems very interesting features. Really a useful tool. Thanks @jesta for creating it and @jerrybanfield for bringing it to us with a tutorial. Appreciate it. @jerrybanfield Yes really good post. Okay... From your post I get more questions. Is there "pools" for delegate to get a share of the income for witness? It should be the case. Then I don't understand the "vests" concept. What's that? Finally the revenue sharing from delegating SP isn't clear. Thanks anyway, as always your posts are informative even if in this case it's raises more questions.